Robert Shrimsley, one of the FT's satirical columnists (when he isn't managing FT.com) wrote about a recent Mayfair dinner hosted, I suspect, by Edelmans to promote their Global Trust Barometer. The Barometer is a valuable institution that has been going for 15 years. We have written about it in the past and we expect to return to it. The dinner was attended by former ministers, former and current CEOs and senior journalists (such as him). They made a well-educated, well-heeled cohort of 'serious concerned people'. One of the Barometer's findings was a drop in trust in leaders, institutions and elites. The decline in trust in the CEO as a credible spokesperson continued for the third consecutive year, with trust levels now at 31 percent in developed markets. Globally, CEOs (43%) and government officials and regulators (38%) continue to be the least credible sources for information. CEOs lagged far behind academic or industry experts (70%) or "people like me" (60%). "an evening of high-level hand-wringing, the kind of self-reinforcing event that goes on all over London most weeks." 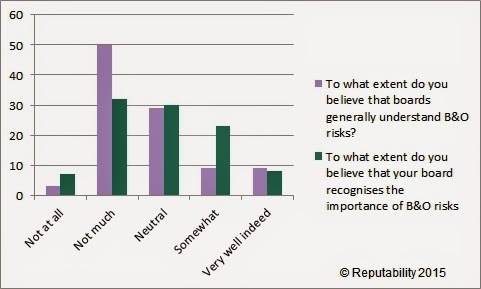 We recently carried out a poll on perceptions of behavioural and organisational risk. The cohort consisted of almost 100 company secretaries and senior in-house lawyers, who had recently completed an intense training session we had run to introduce them to behavioural and organisational risk and its tragic reputational consequences. These were people who often know more about 'where bodies are buried' than most. We asked two pairs of questions, separating them as much as we could (which wasn't much) to reduce the effect of 'anchoring bias'. 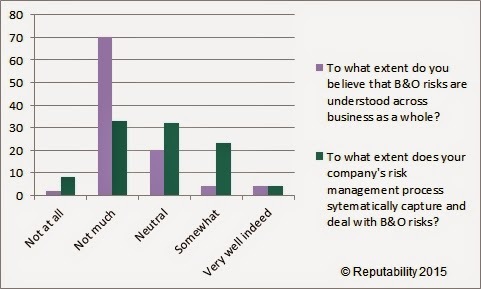 The first pair of questions concerned the extent to which behavioural and organisational risks were understood across business generally and in their own organisation. The results clearly imply that those present thought that their own organisation deals with behavioural and organisational risks better than others could. Our second pair of questions produced a similar pattern. Whilst not suggesting a solid working knowledge, those present clearly thought that their own board understood these risks rather better than boards in general. In his second 2015 Reith Lecture, Atul Gawande looked at analogous behaviour in a different context: surgery. After introducing a checklist system for surgeons, modelled on those used by airline pilots for procedures routine and emergency, he surveyed surgeons on their attitudes. Whilst most surgeons had become very happy to use the checklist system, about 20% really disliked it even after three months' use. So he asked those who really disliked the system whether, if they were to have an operation, they would wish their surgeon to use such checklists. 94% wanted their surgeon to use the checklists! The implication was clear: I don't need such a system but everyone else sure does! Drivers fit a similar pattern: Apparently almost all of us think we are above average drivers! This is a very common behaviour. Shrimsley mentioned confirmation bias. He might also have mentioned the availability heuristic, optimism bias and above all superiority bias and the overconfidence effect. All are widespread behavioural phenomena and all lead to a corresponding behavioural risk that we can summarise as complacency risk. Add herding behaviour and the effects of social norms, and 'groupthink', a dangerous organisational risk, is the inevitable result. At a dinner party, the consequences are likely to be dull and self-reinforcing conversation because participants' knowledge and experiences all come from the same box. Trapped inside, they may be unable to see they are in a box, let alone see the box from the outside; still less can they examine the beliefs and assumptions in and around the box. Translated to leadership teams of companies, governments and other organisations,the effect of these relatively homogeneous groups (that probably see themselves as diverse) is as predictable as it is devastating. Whilst these behavioural and organisational risks are predictable, and blindingly obvious to an outsider given access to insiders' knowledge, they commonly lie unrecognised and untreated for long periods before they blow up. We plan a blog with our latest research on this, but you already know why this is so. The challenge for leaders is to understand not just how others see them but how others would see them if they had an insider's knowledge.